Professor Cooper obtained his Ph.D. in Organic Chemistry and B.Sc and Honours Degree (1st Class), from the University of Adelaide, Australia. He was a Postdoctoral Fellow with Prof Dudley Williams, at the Cambridge Centre for Molecular Recognition, University of Cambridge, UK; and was a Senior Consultant at Biacore AB (Reporting to CEO) in Sweden. Prof Cooper was also a Postdoctoral Fellow with Prof Chris Abell, Cambridge Centre for Molecular Recognition at the University of Cambridge, UK. He is an NHMRC Australia Fellow and Professor of Chemical Biology at the Institute of Molecular Bioscience, and is an Affiliate Professor in the School of Chemistry and Molecular Biology at The University of Queensland. Professor Cooper is a scientific entrepreneur with a solid track record of innovation, industry engagement, intellectual property generation, and business development. 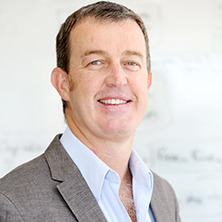 He was Founder and Managing Director of Cambridge Medical Innovations (now part of Alere Inc.), NHMRC Australia Fellow, Co-founder and CSO of Akubio Ltd (now part of TTP Labtech Ltd.). Professor Cooper has raised >$40m from industrial, government and venture capital sources. He was responsible for positioning of start-up companies and management of multidisciplinary R&D teams with programmes in electronics, physics, materials science, chemistry, microbiology, virology and diagnostics. He is a driver of anti-infective drug discovery programmes with lead compounds pre-clinical and has successfully launched multiple product families to market. Professor Cooper has over 100 publications in high-ranking peer reviewed journals and 20 patents. We believe we can more effectively treat patients by improving the way we understand and diagnose disease. Our research is aimed at discovering new ways of detecting and treating bacterial infections, inflammatory disease and cancer. We are designing and developing novel antibiotics active against drug-resistant bacteria, known as superbugs. The alarming growth of superbugs, coupled with the paucity of companies working in this area, gives impetus to this research and our work to inform the community of these important health issues through the media. We also work on tuberculosis and dengue fever, diseases responsible for millions of deaths in the developing world. Our research is leading to new ways to diagnose infections caused by bacteria and viruses, and a deeper understanding of the molecular mechanisms that lead to the evolution and spread of drug resistance. Many of our researchers have significant experience in both academia and industry, with past projects leading to products on the market today. We collaborate with government agencies and pharmaceutical, biotechnology and medical device companies in Australia, Asia, the UK and the US. We have a strong translational focus and aim to deliver innovative solutions for unmet medical needs in the community. During the past 12 months, we have gained a deeper understanding of the role of gut biota, which are the bacteria that live in our digestive system, and how this affects inflammation in the development of diseases such as asthma, chronic obstructive pulmonary disease, diabetes and cancer. This basic research helps us to develop new methods to diagnose and more effectively treat patients affected by these complex and deadly diseases. Furthermore, in partnership with more than 12 laboratories worldwide, we are designing and developing new molecules to target the interface between infection and our immune system’s response that leads to acute and chronic inflammatory disease. Journal Article: The eagle effect and antibiotic-induced persistence: two sides of the same coin? Tuberculosis (TB), an infectious disease most commonly caused by Mycobacterium tuberculosis, claims ~ 2 million lives each year. Benzothiazinones (BTZs) target the essential M. tuberculosis cell wall building enzyme DprE1. BTZs are pro-drugs, activated in the bacterium by reduction of an essential nitro group to a nitroso derivative which then specifically reacts in the active site of DprE1, inactivating the enzyme. While this covalent mechanism imparts exquisite activity to the compounds, the required nitro group represents a liability in terms of toxicity and in vivo metabolism. Recently, the crystal structure of DprE1 was published and we aim to combine this new structural information with the extensive information available in the existing program to develop novel antitubercular compounds without the nitro group liability. This project aims to develop new lead compound classes targeting M. tuberculosis and will involve structure based design and medicinal chemistry. It will leverage the existing expertise within the group in developing in vivo active compounds targeting DprE1. Interleukin 1β is a key component of the innate immune response vital for host protection against invading pathogens and aiding in cellular and tissue repair. However, IL-1β is also a potent pyrogen and dysregulation leads to a wide variety of diseases including auto inflammatory disorders. We have recently discovered a series of compounds which modulate IL-1β through targeting the NLRP3 inflammasome signalling cascade. These small heterocyclic molecules also show early signs of activity in central nervous system disorders. This project will aim to examine the full potential of the structural class in disorders of the CNS (multiple sclerosis, Alzheimer’s and Parkinson’s disease) while also exploring the therapeutic potential of the class as a whole through structure activity relationship and mode of action studies. Ultimately new optimised drug leads will be generated for development. This is primarily a medicinal chemistry project but is highly interdisciplinary requiring a dedicated scientist keen to expand their skills and knowledge as the project requires. Excessive inflammatory response results in a range of serious medical conditions. Neutrophil mobilisation is a key component of the inflammatory cascade resulting from injuries such as ischemia. A series of short peptides designed for an inflammation pathway GPCR target have recently show unexpected activity at a related GPCR that has been validated as an attractive therapeutic possibility. These peptides contain a key structural motif that is ripe for exploitation in a peptidomimetic hit-to-lead drug discovery project. Initial studies will focus on exploring the structure-activity relationship (SAR) around the active peptides, followed by a concerted effort to improve potency and drug-like properties via peptide to small molecule peptidomimetic strategies. We seek a motivated and talented student interested in medicinal chemistry, with a focus on peptidomimetic design, chemical synthesis and structural NMR willing to learn a range of techniques to drive this multidisciplinary project. Cooper, Matthew Label-free biosensors: Techniques and applications. Cambridge, U.K.: Cambridge University Press, 2009. Label-free technologies: Which technique to use and what to watch out for! The eagle effect and antibiotic-induced persistence: two sides of the same coin? Song, Erfei, Jahng, James W. S., Chong, Lisa P., Sung, Hye K., Han, Meng, Luo, Cuiting, Wu, Donghai, Boo, Stellar, Hinz, Boris, Cooper, Matthew A., Robertson, Avril A. B., Berger, Thorsten, Mak, Tak W., George, Isaac, Schulze, P. Christian, Wang, Yu, Xu, Aimin and Sweeney, Gary (2017) Lipocalin-2 induces NLRP3 inflammasome activation via HMGB1 induced TLR4 signaling in heart tissue of mice under pressure overload challenge. American Journal of Translational Research, 9 6: 2723-+. Emerging pathogenic links between microbiota and the gut-lung axis. Chemical philanthropy: a path forward for antibiotic discovery? What is label-free screening and why use it in drug discovery? Cooper, Matthew A. and Halai, Reena (2012) What is label-free screening and why use it in drug discovery?. European Pharmaceutical Review, 17 6: . Cooper, Matthew (2010) How to stress superbugs. Australasian Science, 31 2: 31-32. Non-optical screening platforms: The next wave in label-free screening? Optical biosensors: Where next and how soon? Cooper, Matthew A. (2006) Current biosensor technologies in drug discovery. Drug Discovery World, 7 3: 68-82. Hawkins, Edward, Cooper, Matthew and Campbell, Ian (2006) Acoustic detection technology in the analysis of biomolecular interactions. Innovations in Pharmaceutical Technology, 21 30-34.
Cooper, M. A. (2002) Akubio: Label-free screening of molecular interactions using acoustic detection. Drug Discovery Today, 7 5: S5-S7. Ridley, SH, Ktistakis, N, Davidson, K, Anderson, KE, Manifava, M, Ellson, CD, Lipp, P, Bootman, M, Coadwell, J, Nazarian, A, Erdjument-Bromage, H, Tempst, P, Cooper, MA, Thuring, JWJF, Lim, ZY, Holmes, AB, Stephens, LR and Hawkins, PT (2001) FENS-1 and DFCP1 are FYVE domain-containing proteins with distinct functions in the endosomal and Golgi compartments. JOURNAL OF CELL SCIENCE, 114 22: 3991-4000.
Cooper, M. A., Lucas, M. A., Taylor, J. M., Ward, A. D. and Williamson, N. M. (2001) A convenient method for the aromatic amino-Claisen rearrangement of N-(1,1-disubstituted-allyl)anilines. Synthesis, 4: 621-625.
Cooper, M. A., Carroll, J., Travis, E. R., Williams, D. H. and Ellar, D. J. (1998) Correction: Bacillus thuringiensis Cry1Ac toxin interaction with Manduca sexta aminopeptidase N in a model membrane environment (Biochemical Journal (1998) 333 (677-683)). Biochemical Journal, 335 3: . Cooper, M. A. and Ward, A. D. (1996) Erratum: Hydroxyselenation of allylic alcohols (Tetrahedron Letters (1995) 36 (2327-2330)). Tetrahedron Letters, 37 28: . Cooper, M. A., Pyke, S. M. and Ward, A. D. (1995) Unusually stable hydrates of N-substituted 3-hydroxy-2-(phenylselenenyl)methylpiperidine derivatives. Where is the water? An NMR study. Bulletin of Magnetic Resonance, 17 1-4: 244-245. Pinkerton, James, Kim, Richard, Mayall, Jemma, Ali, Md. Khadem, Starkey, Malcolm, Robertson, Avril, O'Neill, Luke, Cooper, Matthew, Hansbro, Philip and Horvat, Jay (2017). High Fat Diet-Induced Obesity Promotes Steroid-Resistant Asthma Through An Nlrp3 Inflammasome-Dependent Mechanism. In: Respirology. , , (65-65). .
Budden, Kurtis, Gellatly, Shaan, Wood, David, Morrison, Mark, Cooper, Matthew, Dennis, Paul G., Hugenholtz, Philip and Hansbro, Philip (2017). Dietary fibre and microbial metabolites protect against cigarette smoke-induced lung pathology in mice. In: 22nd Congress of the Asian Pacific Society of Respirology, Sydney, Australia, (4-5). 23–26 November 2017. Tate, M., Pinar, A., Dowling, J., McAuley, J., Robertson, A., Cooper, M. and Mansell, A. (2016). Delayed inhibition of the NLRP3 inflammasome during pathogenic influenza A virus infection in mice reduces disease severity and prolongs survival. In: European Journal of Immunology. International Congress of Immunology (ICI), Melbourne Australia, (567-567). Aug 21-26, 2016. Tate, M., Ong, J., Dowling, J., Robertson, A., Cooper, M. and Mansell, A. (2016). Targeting the NLRP3 inflammasome is a viable option for the treatment of pathogenic influenza virus infection. In: European Journal of Immunology. International Congress of Immunology (ICI), Melbourne Australia, (97-97). Aug 21-26, 2016. Kim, R. Y., Pinkerton, J. W., Essilfie, A. -T., Robertson, A. A., Baines, K. J., Mayall, J. R., Starkey, M. R., Wark, P. A., Gibson, P. G., O'Neill, L. A., Cooper, M. A., Horvat, J. C. and Hansbro, P. M. (2016). Nlrp3 Inflammasome-Mediated, Il-1 beta-Dependent Inflammatory Responses Drive Severe, Steroid-Insensitive Asthma. In: International Conference of the American Thoracic Society (ATS), San Francisco, California, (). 13-18 May 2016 . McGarry, Trudy, Connolly, Mary, Coll, Rebecca C., Robertson, Avril A. B., Cooper, Matthew A., O'Neill, Luke A., Veale, Douglas J. and Fearon, Ursula (2014). Novel Compound Cytokine Release Inhibitory Drug 3 (CRID3) Inhibits the NLRP3 Inflammasome in Rheumatoid Arthritis. In: Abstract Supplement: 2014 ACR/ARHP Annual Meeting. 78th Annual Meeting of the American College of Rheumatology/49th Annual Meeting of the Association of Rheumatology Health Professionals, Boston, MA United States, (S461-S461). 14-19 November 2014.
de Valliere, Cheryl, Vidal, Solange, Eloranta, Jyrki J., Lang, Silvia, Vetter, Irina, Inserra, Marco, Lewis, Richard J., Cooper, Matthew A., Wang, Yu, Ludwig, Marie-Gabrielle, Kullak-Ublick, Gerd A., Wagner, Carsten A., Rogler, Gerhard and Seuwen, Klaus (2012). Functional consequences of G protein-coupled receptor 68 (GPR68/OGR1) overexpression in intestinal epithelial cells. In: Digestive Disease Week (DDW), San Diego, CA, United States, (S809-S809). 19-22 May 2012.
de Valliere, Cheryl, Vidal, Solange, Vetter, Irina, Inserra, Marco, Lewis, Richard J., Cooper, Matthew A., Bentz, Susanne, Wang, Yu, Ludwig, Marie-Gabrielle, Kullak-Ublick, Gerd A., Seuwen, Klaus, Wagner, Carsten A., Rogler, Gerhard and Eloranta, Jyrki J. (2012). The gene encoding the G protein-coupled receptor 68 (GPR68/OGR1) is regulated by TNF, hypoxia, and low pH in human monocytic cells. In: Digestive Disease Week (DDW), San Diego, CA, United States, (S870-S870). 19-22 May 2012. DE Valliere, C, Hiller, C, Kellermeier, S, Vetter, I, Inserra, M, Lewis, RJ, Cooper, MA, Vidal, S, Seuwen, K, Wagner, CA, Fried, M, Kullak-Ublick, GA, Rogler, G and Eloranta, JJ (2011). Expression of Proton-Sensing G Protein-Coupled Receptor 68 (ogr1) Is Increased by Tnf-Mediated Inflammatory Signalling. In: British Journal of Clinical Pharmacology. unknown, unknown, (35-35). unknown. DE Valliere, C, Hiller, C, Kellermeier, S, Crucet, M, Vetter, I, Inserra, M, Lewis, RJ, Cooper, MA, Vidal, S, Seuwen, K, Wagner, CA, Fried, M, Kullak-Ublick, GA, Rogler, G and Eloranta, JJ (2011). Expression of the G Protein-Coupled Receptor 68 is Increased by TNF-Mediated Inflammatory Signalling. In: Gastroenterology. Conference on Digestive Disease Week 2011, Chicago Il, (S837-S838). May 07-10, 2011. Kelling, S., Cooper, M. A., Stirrups, K., Karamanska, R., Ostanin, V. P., Klenerman, D., Slepstov, A., Rehak, M., Dultsev, F. N., Minson, T. and Abell, C. (2002). Sensitive and direct detection using rupture event scanning (REVS™). In: Proceedings of the 2002 IEEE International Frequency Control Symposium and PDA Exhibition, , , (756-759). May 29, 2002-May 31, 2002. Podlich, DW and Cooper, M (1999). Modelling plant breeding programs as search strategies on a complex response surface. In: McKay, B, Yao, X, Newton, CS, Kim, JH and Furuhashi, T, 2nd Asia-Pacific Conference on Simulated Evolution and Learning (SEAL 98), Canberra Australia, (171-178). Nov 24-27, 1998. Unusually stable hydrates of N-substituted 3-hydroxy-2-(phenylselenenyl)methylpiperidine derivatives. Where is the water? An NMR study. Cooper, MA, Pyke, SM and Ward, AD (1995). Unusually stable hydrates of N-substituted 3-hydroxy-2-(phenylselenenyl)methylpiperidine derivatives. Where is the water? An NMR study.. In: Gorenstein, DG, Bulletin of Magnetic Resonance, Vol 17, Nos 1-4, December 1995. XIIth Meeting of the International-Society-of-Magnetic-Resonance (ISMAR 95) - the Next 50 Years, Sydney Australia, (244-245). Jul 16-21, 1995. Lindahl, Fredrik, Hoang, Huy Ngoc, Fairlie, David P. and Cooper, Matthew A. (2015): Reactivity of commercially available Fmoc amino acids: supplementary information. The Royal Society of Chemistry. Dataset. The human pathogenic fungus Cryptococcus neoformans is a common cause of fatal fungal meningioencephalitis in immunocompromised individuals, typically AIDS patients and persons undergoing immunosuppressive treatment such as transplant and chemotherapy. In sub-Saharan Africa, cryptococcosis is the second most deadly infectious disease behind only malaria. Infections of humans caused by pathogenic fungal species such as C. neoformans are highly refractive to pharmacological intervention due to similarities in our shared eukaryotic physiology. Antifungals are few in number, often expensive, frequently toxic to humans, and have notoriously variable efficacy across the spectrum of human fungal pathogens. The aim of this medicinal chemistry PhD is to develop promising new antifungal lead compounds. An approach of particular interest is exploiting differences in essential proteins that are well characterised in both the human host and the fungal pathogen to gain selective antifungals through structure based drug design. We have already conducted an extensive screening campaign where a number of hits have been selected for further work. This project will require a talented and creative synthetic chemist willing to work across multiple scientific disciplines to progress the project. We seek a motivated and talented student interested in structural biology and label-free analysis, with a focus on structural NMR and X-ray crystallography, for a project investigating the interactions of glycopeptide antibiotics with their bacterial target. Extensive biophysical characterisation (X-Ray crystallography, NMR, Surface Plasmon Resonance and Isothermal Titration Calorimetry) will be conducted on a range of known and novel glycopeptides of varying structure, and the complexes they form with Lipid II and mutated Lipid II. The physical analysis will be integrated with state of the art modelling and simulation techniques to provide an unprecedented ability to model structural alterations and predict binding affinities that correlate with antimicrobial activity and the results used to design new theoretical constructs. The applicant must be willing to learn a range of techniques to drive this multidisciplinary project. As part of the ongoing antimicrobial research, we are interested in developing a comprehensive knowledge base system for antimicrobial drug discovery, especially against Gram-negative bacteria such as E. coli, P. aeruginosa and K. pneumonia. The aim of the knowledge base system is to collect and link all information relevant for the discovery of novel antibacterial compounds, including chemical and microbiological information, using modern chemo- and bio-informatic data management and classification (ontology) system. The main aim is to use the system build comprehensive predictive models for antimicrobial activity, using various machine learning methods based on the chemical structure of a compound. The project will utilize the vast amount of in-house data generated from the many different antibacterial drug discovery projects as well as from high-through put screening campaigns specifically design for this project. These predictive models will be an integral part of our antibacterial drug discovery projects. We are looking for highly motivated candidates interested in data modeling and machine learning, data and knowledge management, as well as strong interest in chemoinformatics and bioinformatics. How and why do small molecules (drugs) penetrate bacterial membranes? As part of the ongoing antimicrobial research, we are interested in developing a comprehensive predictive system for antimicrobial activity, especially against Gram-negative bacteria such as E. coli, P. aeruginosa and K. pneumonia. The aim of the project is to use a mechanistic approach in the development of novel compounds. Gram-negative bacteria possess an innate resistance to many of the antibacterial compound classes due to their additional outer membrane, limiting penetration and accumulation of active compounds within the bacterial cell. It is currently difficult to predict the likelihood of activity against Gram-negative bacteria, due to the lack of information on how and why compounds penetrate bacterial membranes. The aim of the project is to study the outer and inner membrane penetration of various antibacterial compounds, utilizing a vast range of different assay technologies (visualization, labeled and label-free assays, chemical analytical technologies), accessible out our facilities. We looking for high motivated candidates interested in microbiology, biochemical and biological assay development, as well as with a strong interest in the discovery of novel active compounds against bacteria, including interest in chemical analysis. Most drug discovery and development projects rely on ligand based virtual screening methods, in which no structural information of the target enzyme or protein is known and the selection of novel potentially active compounds is only based on a chemical information of known active (and non-active) compounds. Current ligand based methods lack or under-represent the three-dimensional spatial information of compounds. The project aims to stream line the workflow and incorporate off-target activity, pharmacokinetic property and localization prediction in the process. The aim is to optimize the ligand based screening methods for mainly cell-based and in vivo assays which require additional properties such as cell penetration, metabolic stability and low off-target activity, which are mostly ignored in current methodologies. The project will have access to a wide range of chemo/bio-informatic tool kits, statistical tool kits and workflow management systems (pipeline pilot), as well as a high-performance computer infrastructure. For this project we are looking for highly motivated candidates with an interest in computer based data modeling and molecular modeling, and an interest in novel drug discovery. The candidates will be working within multiple drug discovery projects and will require good communication skills. Inflammation is a protective biological response the human body instigates when challenged with a harmful stimulus. It is crucial in innate immunity and is tightly regulated. The complement cascade plays a significant role in this innate immune response, where C3aR and C5aR receptors play a huge role in regulation. The C5a receptor is of particular interest to us it has been implicated in a range of disorders including inflammation, chronic lung disease, arthritis, bacterial pneumonia and sepsis. The second known, but not well characterized C5a receptor C5L2, has been reported to be a decoy receptor for C5aR (crucial receptor for mediating inflammation). The group is currently undertaking preliminary studies to determine how and if C5L2 and C5aR interact with one another and the individual will be involved in a continuation of this work. The individual will be involved in deciphering signalling mechanisms, and finding a therapeutic use for this receptor with the help of the chemistry team to design and synthesise ligands. Highly motivated candidates, with an interest immunology and innate immunity are sought for a PhD project looking at age dependent changes in the NLRP3 inflammasome against Gram-positive bacteria. Mouse in vivo work, cellular and biochemical assays, as well as microscopy/live animal imaging techniques will be extensively used to explore the role of NLRP3 inflammasome cascade initiated after infection in adult and aged animals. Candidates will be expected to be familiar with basic immunological concepts, and be prepared to learn animal handling and immune assays/techniques. Solid supported lipid bilayers are biomimetic reconstructions that can closely reproduce the natural environment of cell-membrane bound probes, thus insuring proper surface orientation, molecular arrangement and fluidity for binding. We propose to immobilize supported lipid bilayer on magnetic nanoparticles and to introduce suitable receptors on the surface to generate a library of novel probes for biosensing and biophysical studies. The major aim of the PhD project is the development of a library of functionalized supported lipid bilayers on magnetic particles and to develop novel nanotechnologies for biosensing. In addition, extensive biophysical characterization of the conjugates will provide novel insight on the mechanism of interaction with the target molecules.